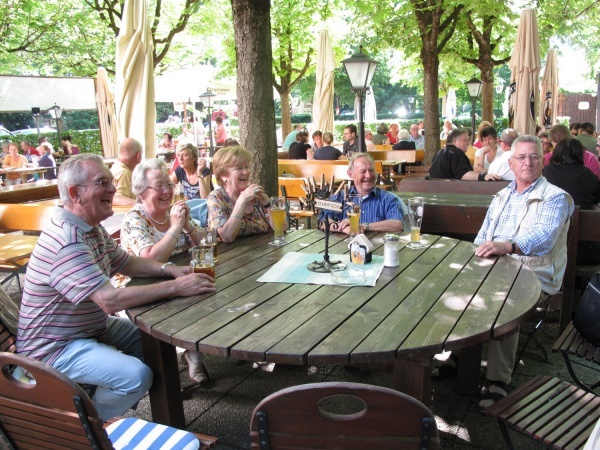 The Einkehr zur Schwaige beer garden is located in the southwestern part of Munich in the district Fürstenried. The beer garden is not too large in size and has therefore a relaxed, almost familiar atmosphere. Nearby attractions are the Fürstenried Palace and the woodlands of Forstenrieder Park. The word "Schwaigen" or "Sweiga" refers to the homesteads which specialised in cattle farming during the 12th century in Bavaria. In those days the landlord gave his cattle to the farmer (Schwaiger). In exchange the farmer had to increase the lifestock as well as produce cheese and butter for the landlord. The story of the Fürstenrieder Schwaige dates back to the beginning of the 10th century, when three homesteads were located in the forests around the village of Planeck. In 1707 a small hunting castle was built next to the Schwaige, which then had the name Poschetsrieder Schwaige. In 1715 the elector Max Emanuel obtained the homestead, changed its name to Fürstenried and built a castle on the grounds. The first innkeeper of the Schwaige was a farmer, who received the license to sell beer. In 1854, the new owner baron Beck-Peccis closed the inn, which later reopened in 1887. Following several ownership changes, the Schwaige had to be demolished due to the deteriorating condition of the building. In 1985 the brewery Spaten-Franziskaner built the new Einkehr zur Schwaige, which closely resembles the former building. Einkehr zur Schwaige beer garden has about 600 seats in the shade of young chestnut trees and sun umbrellas. Some of the traditional beer benches have backrests. A highlight of the self-serviced area is a several metres long table, which is cut out of one gigantic tree. 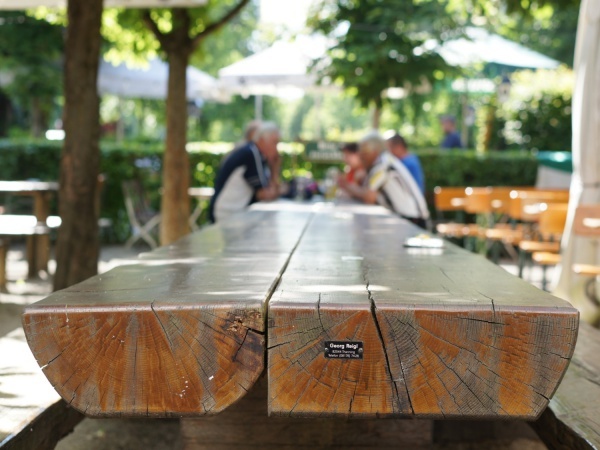 About 50 people can find place on this unusual table, making it suitable for larger groups. The food stall offers Bavarian beer garden meals, such as Hendl (roasted chicken), spareribs, Krustenbraten (pork roast with crackling), Wurstsalat (sliced sausage salad) and Obatzda. On sunny days guests can buy fresh Steckerlfisch (grilled fish on a stick) at a separate stall. The beer served is Spaten and one Maß Hell (lager) costs €7.80 (May 2015). The waitress served area is located behind the restaurant building. The beer garden is open Monday to Friday from 3pm, and throughout the weekend and on public holidays from 11am. Closing time is about 10pm, on the weekends about midnight.